The Company students present their annual awards ceremony on Thursday 7th December. 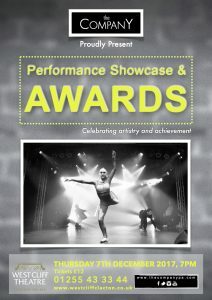 The talented students perform set pieces and showcase their performance skills in an evening designed to celebrate their achievements. Awards are presented for Improvement, Dedication, Personality, Showperson and Mr Aaron’s coveted STAR award.